Carte du Monde Connu des Anciens au Temps de Ptolemee. 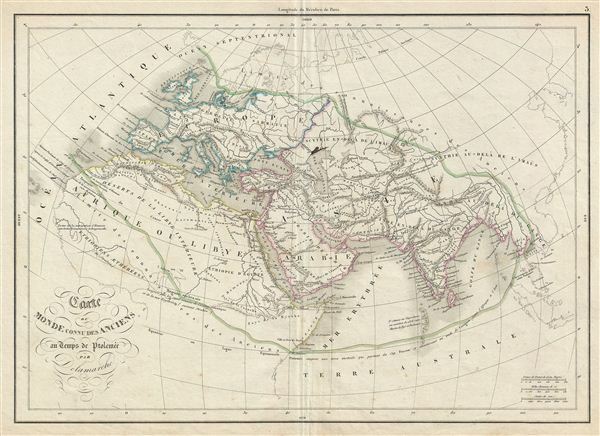 This is a beautiful example of Alexandre Delamarche's 1850 map of the ancient world, including Asia, europe and Africa. The map shows the world of antiquity from the Atlantic Ocean to Burma in Asia and from the Indian Ocean to the North Sea. It includes all of europe, Arabia, parts of Asia including the Indian Subcontinent, and the northern part of Africa. The extent of ancient geographical knowledge is identified by a green line running just south of Scandinavia, across northern europe, then southeast, skirting the southwestern border of China, but embracing India, Burma, and Siam, though not Malay, then laterally bisecting the Indian Ocean and running northwest just south of the Sahara to meet the Atlantic in Morocco. A more contemporary geography in ghosted in beyond the green line to give readers better context. Throughout, the map identifies various cities, towns, rivers, mountain passes and an assortment of additional topographical details. Political and regional borders are highlighted in outline color. This map was issued by Delamarche as plate no. 5 in his Atlas Delamarche Geographie Modern. Very good. Some wear on original centerfold. Blank on verso. Minor ink stain over the Caspian Sea.